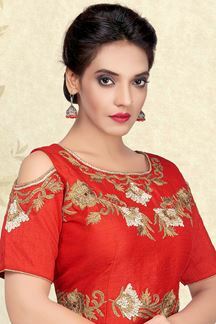 Be ramp ready wearing this graceful red georgette saree embellished all over with flower shaped zari buttis spread across the body of saree while the border running all along the length of saree is a rich gold zari in paisley motifs followed by zari flowers and gold borders for completion; adorning side and end of pallu border being a single gold one. This saree is accompanied with matching fabric unstitched blouse. The blouse in the picture is for photo purpose only. Note: Color may slightly vary due to digital photography.